This is the third of a series of posts looking at attempts to use theories about the future to justify removing or downgrading the amount of knowledge taught. The first part can be found here and the second here. We know that the jobs of the future are going to be talent-based. They’ll be in knowledge intensive industries. Competition will be fierce, we know that. Although bizarrely this is used as an argument for giving less rather than more priority to knowledge. So why are teachers wasting their own time, and that of the kids, teaching them facts which in a few years time may be utterly out of date? Should we not instead be maximising school contact time by teaching skills, competencies, literacies? After all, it is the ability to work in a team, problem solve on the fly, and apply creative solutions that will be the common currency in the world of future work. Being able to think critically and create a professional network will be the core competencies of the 21st Century knowledge worker. Knowing how – or procedural knowledge – will be a greater asset for most young people. You see, the world of work is in constant change, and that change is accelerating. My 16 year old son has just embarked on training to become a games designer. If, when I was his age I had told my careers teacher that I wanted to be a games designer, he would have asked me whether I wanted to make cricket bats or footballs. Jobs are appearing that didn’t exist even a year or two ago. Other jobs that people expected to be in for life are disappearing or gone forever. Ask the gas mantel fitters or VHS repair technicians. Ask the tin miners, the lamplighters or the typewriter repair people. Er, sorry you can’t ask them. They don’t exist anymore. It seems pointless to doubt that the labour market has changed. There has been a long-term trend away from unskilled labour, and there are more graduates in the labour market than ever. However, at face value this simply gives us reason to think that a greater grasp of traditional academic skills might be necessary for more school leavers. It might suggest a need for more education but not a change in what should be valued in education. In order to suggest that labour market change might indicate that there is less need for traditional academic skills a stronger claim is needed than the mere existence of labour market change. Often it is claimed that jobs have in some way become more unpredictable, and therefore, the required knowledge for those jobs cannot be identified. I have already dealt with the claim (from Shift Happens and countless other sources) that The Top Ten in Demand Jobs in 2010 did not exist in 2004. It is not true, nor was it ever even plausible that it might be true. It is estimated that today’s learner will have 10 to 14 jobs by age 38. 1 out of 4 workers today works for a company for whom they have been employed less than 1 year. More than 1 out of 2 are working for a company for whom they have worked less than 5 years. These claims apparently all originate from American sources, (sources for Shift Happens can be found here) and similar claims, suggesting intense job-changing in the modern labour market, are quite common in the American media. An excellent article in the Wall Street Journal challenged the widespread claim that Americans had, on average, 7 different careers and found it to be baseless and, in the words of one economics professor, “utterly implausible”. More generally, the idea of ever shorter jobs in the American labour market is not supported by the statistics. 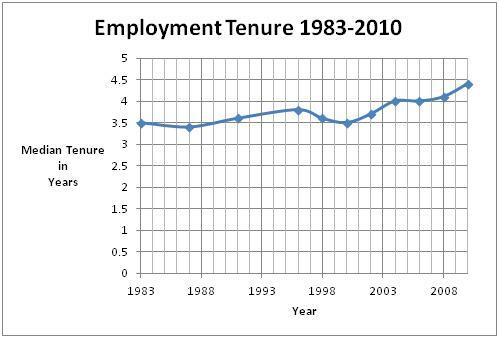 The Bureau of Labor Statistics monitors the median tenure of jobs (here and here) and we can plot the figures to show that, if anything, employment tenure has been increasing in the US. 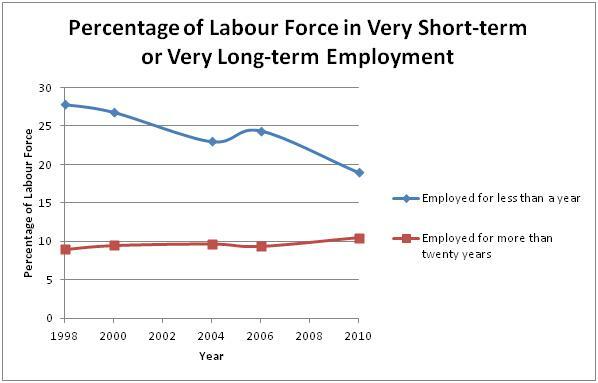 Limited data is also available on the distribution of employees according to tenure, and it does not suggest either an increase in very short jobs, or a decrease in very lengthy jobs in recent years. And while much earlier data might be difficult to compare directly, the figures available for 1983 indicate 27.3% of employees had been in their jobs for less than a year, suggesting that even if we look at a longer-term trend it is not likely to be towards more short-term employment either. Although I am responding to the claims that have American sources, we are unlikely to find any greater instability looking at the UK, as “analysis of the British data indicates even less job changing” (Polachek et al, 1993). The data on job tenure reveal a good deal about the probability process through which most workers eventually settle into near-life-time jobs. The typical pattern is to hold a number of very brief jobs in the first few years after leaving school. Eventually one job turns out to be a good match and lasts several years. The probability that any given new job will become a lifetime job is extremely low for young workers and never rises above 6 percent in any age group. But after a job has lasted five years, the probability that it will eventually last twenty years or more in all rises to close to one-half among workers in their early thirties. As a general matter, the data suggest that most job changes occur in the first few years after a job begins, because the worker or the employer or both perceive that the worker and the job are poorly matched. Once this period of job shopping reaches a successful conclusion, workers have very low probabilities of losing or leaving jobs. Finally,even if a pattern of accelerated job changing was established, then it would not necessarily indicate that this was something that education should prepare young people for, any more than a pattern of high unemployment would justify preparing young people for signing on. The possibility exists that education should seek to change this outcome, not live with it. According to one of the sources referenced by the author of Shift Happens: “On average, the least-educated men held more jobs than the most-educated men, while the opposite is true among women.” This would suggest that frequent job changes are not a brute fact that education needs to compensate for, but something influenced by education. Fenton’s (2006) study of young people in Bristol also found: “The clearest pattern is that of an association between job changing and lower educational achievement, thus giving greatest support to the argument that job changing is associated with a succession of low skill and low pay jobs which offer little reward for the ‘sticker’.” Far from providing an argument for low content education, employment instability would seem to occur to a large degree as a result of insufficient education. I work in IT and since I started in 1981 I have had 13 jobs for 9 employers (and one redundancy). I started out using punch cards and now I use the internet. Friends, especially those younger than me, have experienced multiple redundancies, some giving up a line of work after the second or third redundancy in it. Very many become contractors and abandon permanent jobs altogether. So I would say that in the UK, in my industry at least, there is no pattern of long term employment or fixed career. Perhaps education should be preparing people for this – I don’t know how! But you are still in IT and the transition from punch cards to internet will have taken place gradually and your previously acquired skills won’t have become worthless overnight. In most careers, there has been significant tehnological change but because it is gradual, it doesn’t justify the positions so thoroughly shot down by Andrew. I don’t, by the way, want to dismiss the challenges you have faced in career, merely to say that you do seem to have had a fixed career but with a succession of employers. Would “literacies” in the plural mean foreign language skills? A lot of job changes may be within a skill set. An accountant will move from one firm to another – he will take and use his pre-existing skills. He won’t be starting form scratch. Engineers likewise and these people need lots of hard maths knowledge. Woolly competencies won’t cut it there. I agree. Moving around in a sector is not relevant to the debate – its arguments that the future will involve more changes of career that are used by those that argue for a ‘twenty first century education’. It is such idiocy. The suggestion that the students I now teach using more ‘skills based’ curriculums are better placed to cope with the changing world of work than I and my contempories is utter nonsense – based on a whole range of either unprovable or disproved assumptions. From a very working class background went through secondary education in the 1970s. I had a timetable which consisted of maths, english,social studies,physics, chemistry, geography, pe/games and metalwork. I left school in 1974 and I changed career direction in 1995 but have also changed my job role significantly during my two “careers”. I am in no doubt whatsoever that your average kid coming out of secondary education these days has more problem solving tools at their disposal and is probably both a more effective communicator and teamworker. I believe that this is a result of influences both in school and from society more widely. Would I have coped with any of the changes that I went through more easily if I had been educated today, I think for the first few years of my working life yes, as I used these years to develop those very skills. In my day I believe that people developed such competencies partly during their University level education (but alas not so now I feel). We really are all different however. Leaving aside the issue of whether it is possible to teach thinking skills, do I think it is essential to focus on thinking skills at the expense knowledge. Not only do I think it not essential, I believe that in some circumstances or domains or however you would describe it, teaching thinking skills without context can be very inefficient and at worst ineffective. However, I also hold the view that there can be considerable benefit to teaching thinking skills (assuming that such a thing is possible) especially where kids are not exposed to such in a family setting or in society more widely. I also hold the view that much of this stuff can be “taught” at primary school but then used within the teaching/learning process thereafter. I have a feeling that much of the “dumbing down”, if it exists, is due to party politics, egos of education ministers and a wish to see results improve from year to year in an age of accountability which we observe everywhere from the workplace to the funeral parlour and everywhere in between. The US went through a soul searching period which has resulted in a curriculum which delivers the knowledge necessary to be a US citizen. I have experience of teaching in a system delivering this curriculum which focuses on knowledge, often at the expense of thinking, analysis, reflection and creativity. It is not a pretty sight and it was driven by (but was not a necessary result of) a wish to increase the amount of knowledge in the curriculum. In my school, we have for quite a whlie been teaching to KS3, something we imported from Queensland that was designed for the 21st century. It is supposed to equip pupils with skills as “we don’t know what is needed in the 21st century”. If we don’t know what’s needed, how do we know we are not doing the right thing now? Let me see if I follow the theory correctly. Has anyone ever asked these people why they think that the current vogue educational theory among people from Islington who wear black-rimmed glasses is less likely to change in future than the insights about human nature or our understanding of the natural world which have already endured centuries? If so, what was the answer? I assume this one was an attempt at humour. The year 11s leaving my school this year are much better communicators and teamworkers than I ever was. Unfortunately they can’t actually do much and know even less. The day I was told with a straight face that the new curriculum is ‘less knowledge-based’ was the end of full-time teaching for me. I’m now waiting for the meeting in a few years’ time when I am told, again with a straight face that we need to move to a ‘more knowledge-based curriculum. I love this job. Ruined only by those with delusions of adequacy. There seems to be so many of the idiots now. They know exactly what to say to whom, and how to get on and yet none of them appears to have a coherent philosophy of education and what it is for. If the statistics had asked the question of people age 26 and over how many different jobs they had held, I’m SURE the number would have been lower. But instead, they asked how many JOBS had been held by age 38. In the American labor market, it is quite common for many students to start working at age 16. Most of those early jobs are part-time, just for extra spending money and of short duration. One reason early jobs are of short duration is that young workers often do not have the skills or knowledge required of employers, and therefore lose many of their early jobs. Most of these jobs are also not related to one’s eventual career. I did not have my first job until age 17, the summer after I graduated from high school; even so, I would just like to use myself as an example to show you where these American statistics come from. 1. Legal secretary (5 days): I lost this job after one week because I didn’t fit in at the legal firm, and I also could only type 45-50 words a minute which was too slow. I spend more time cleaning my desk than working. 2. Oil production secretary and company receptionist (6 weeks): lost the job after six weeks because they said I didn’t know “enough of what to do in an office.” When I asked for specifics, luckily they told me the truth–they suggested if I had nothing to do, I should have done things such as go through the company files and look for file folders that needed replacing (nothing like that had occurred to me since I thought they were private). They also pointed out that I did not answer the phone in a friendly, engaging manner (I had asked my boyfriend for advice–instead of my supervisor–and he suggested I answer the phone in a very “cold” voice–which my boyfriend thought was “professional.” I also was asked during the interview if I was “good with figures.” Of course I said, “yes, ” even though I hated math and had never used a calculator. I had to add huge columns of daily production figures from different wells, and could never get them to tally up correctly, meaning my supervisor had to continually fix my problems. Thankfully, when I asked before leaving what the problem was, they told me the truth about all these things, and I really learned from what they shared with me. 3. Toy Company secretary/clerk (one day): I quit at the end of the day when I felt I was being sexually harrassed by my direct supervisor, in addition to very bad working conditions, and was not allowed to talk to the boss. 4. Internal Revenue Form Typist (temporary job of 2 months): I was able to keep this job for two months, the duration of the job probably only because it was a temporary job, and I lived in daily fear of losing this job. As fast as I typed, I managed to get only half as many forms typed as the women working next to me. I did learn to type numbers well. 5. Library Shelver (4 months): This was a night job I held concurrently with the 8-hour job as a form typist (above). I loved this job and did manage to keep it, usually returning home with about 20 books every night to read. 6. Hotel maid (3 months): I worked both Saturday and Sunday concurrently with the above two jobs. I went back to school for two more years, including a year of secretarial school, and the next time I applied for a higher-level secretarial job and was able to keep it, concurrently with going to night school. 7. University secretary (full-time for two years, while going to night school). My last year of university I quit working and went full-time for a year. 8. Secretary at investment banking firm, in the accounting department (6 months). No major problems with this job, but I wanted something more with a college degree. When I had the chance to apply for a job as a stock broker, I was happy to be accepted into the training program at the same firm. 9. Bank Officer: I opened a discount brokerage department for the bank and ran it for two years. After that the bank decided to close the department. 10. I held six jobs concurrently as a substitute teacher for two years (in six different school districts) for which they all called about 5 am each day they needed someone. 11. Sylvan Learning Center (2 months): Part-time job teaching students math after-school. Left this when I found a full-time teaching position. 12. Teacher at a French International School: Teacher of grades 4,5, and6 (all in one classroom) of Math, Science, English, and Social Studies. There were no text books or curriculum for the English portion (4 hours daily) so I had to get books from the library on each subject and try to write up worksheets every night at home. This small, private school paid less than minimum wage, and no benefits (although the teachers from France had full French salaries and benefits) so I had an extra part-time job doing all the day-care at the school both before and after school. I was sleeping only 3-4 hours a night and collapsed of exhaustion after three months. Then I moved overseas three months later with my foreign husband. At this time I was age 38, having held 12 jobs. Now can you see where these American statistics come from? IF one looked only at jobs held since age 26, or so (and didn’t count the part-time or substitute teaching jobs), in my case, this would have been Bank Officer, Teacher at the Intl. School (2 jobs), plus three jobs I have held overseas in 20 years. So that would be about six jobs. I also see that other countries (outside of the United States) have a lot of “work rules” where companies cannot fire bad workers. For example, where I live now, employees cannot be fired for doing poor work, or showing up late. They can only be fired for not showing up at all for a considerable time, for showing up drunk, or for being caught stealing. The work rules in Britain are no doubt not as free as the United States, where employees can be fired, or let go, at the employer’s will, at any time, even without a reason in many states. In most cases there would, of course, be a reason, but it could even be a reason that the employer changed their mind and decided they didn’t need that extra employee. I can see lots of evidence for the wish to see more skills taught including thinking, teamworking and communication but I am unable to see much evidence suggesting that teaching knowledge should be lower priority in the curriculum. The jobs by age 38 type statistics are for me simply a diversions and almost irrelevant and a bit of a smoke screen. Most people have used little if any of the geography, history, chemistry, physics, biology, English, Maths during their working lives irrespective of the number of jobs they worked at so the amount of knowledge was always irrelevant for most from a “working life” perspective. Whether I have 1 job or 50 jobs it matters little whether 1 know Newton’s 2nd law (unless of course I do Newton’s 2nd law as a job). Sounds like you are in France. I worked for a US company in France and my US colleagues couldn’t believe the working conditions. Plus, of course, 7 weeks holiday -two in the US- and nominally a 35 hour week. Depends on what they do, no not if they are a kitchen porter, but if they are in science, technology or engineering they would have been required to relearn basic scientific principles. Also god written English, plus perhaps knowledge of a foreign language, is must for any one writing reports if they are to be comprehensible. As for thinking, teamworking and communication, well if you are scraping food of plates thinking is not much of an advantage, teamworking, if it is indeed any use at all, is learnt during games and communication is learnt during English lessons. What may be of more practical use is an explanation of the Machiavellian tactics that their future colleagues, subordinates and managers will use in the workplace. I don’t we would disagree paysan, I think it is more a matter of degree (excuse the pun). My point is that most school leavers in the UK will have learnt a great deal of factual knowledge that they will never use. Clearly any kid will use some of their school acquired knowledge, and some more than others. As one who feels that school should be about developing rounded individuals with a broad body of knowledge that will allow them to lead a successful life outside of work I am all for a broad education. The world is a different place to the one I entered on becoming an adult and I do feel that the education system in England needs to reflect that I believe. Sure some career options will build upon school geography or history, maths and/or English knowledge but many will not and certainly few will develop all of these subjects. I think also that interdependence and communication are increasingly important life skills these days both inside and outside of work for many although not all, and sadly the only place that many of these kids will be able to develop such skills is in school. I am warming to the idea of a tiered system in which those who are willing and able to take on a broad curriculum to give them a good platform for a productive life both inside and outside work would be sent to a suitable place of learning. These guys would get lots of knowledge and support to develop thinking skills etc. The chavs who will not use a broad education in the short or medium term could be given a dumbed down education with little knowledge content and basic life skills leading perhaps to a vocation. Bear in mind that in the old days, firms used to train up kids for vocations but increasing this cost has been pushed onto the public purse. There could be those in the middle that have a combination of the two. Any late developers could take responsibility for themselves and get an education of their choice later as long as they have saved a few pennies.